I've been super busy with so many different things happening in my life lately that I sometimes find myself either exhausted or spaced-out to do the things I used to love doing. One of which is cooking. When I was pregnant with my little boy Choi, I used to be in the kitchen the whole day, preparing lunch and dinner for my family. I loved how experimenting with different dishes and seeing them devour it with much gusto makes me satisfied. So to me, cooking has always been some kind of therapy. It calms me down and makes me happier next to of course,writing. My mom used to tell me that I have an addiction to cooking dishes that are always flavored with sauces. To be specific, I like my recipe mixed with oyster sauce all the time. From beef with broccoli, steak cooked in turbo broiler that was simmered in oyster sauce, name it . There's this one brand I use but then I realized, it's too salty. I wanted something different. 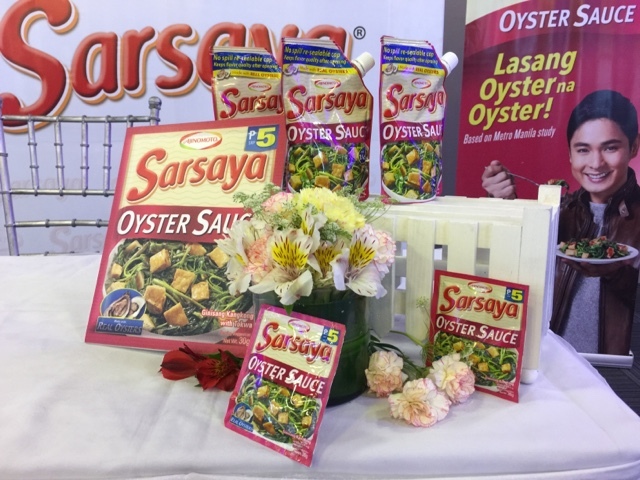 Sarsaya is concentrated from real oysters, complete with seasonings to provide a delicious blend of savory, sweet and salty taste to any dish. 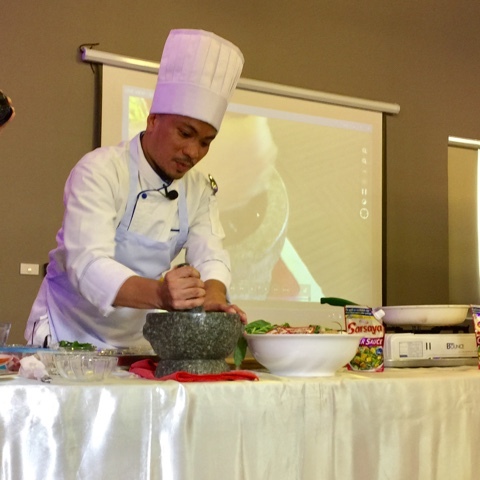 Chef Mcrhyan Rodrigo facilitated a live cooking demon and cook-off where he cooked Pinoy favorites like Ginisarsayang Kangkong with Tokwa and his own recipe, Thai Style Stir Fried Chicken using Sarsaya Oyster Sauce. 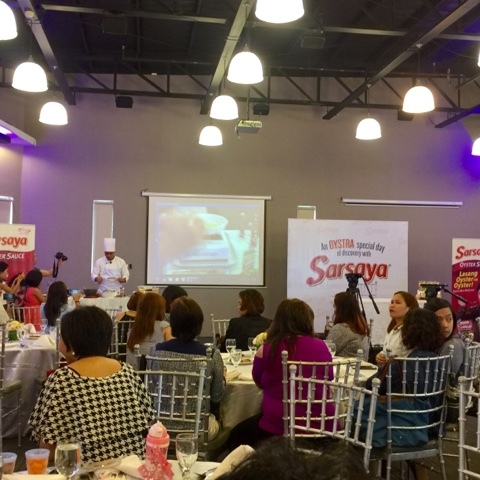 Two chosen guests were invited to participate in the cook-off where they discovered the convenience of using Sarsaya Oyster Sauce to turn ordinary dishes extra special and flavorful. 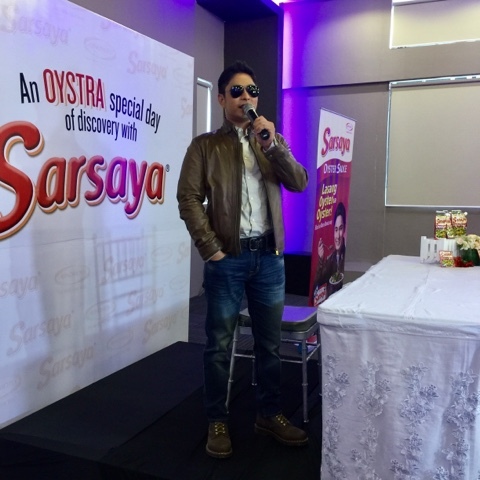 Of course, Ajinomoto chose no less than the Primetime King, Mr. Coco Martin to endorse Sarsaya Oyster Sauce. 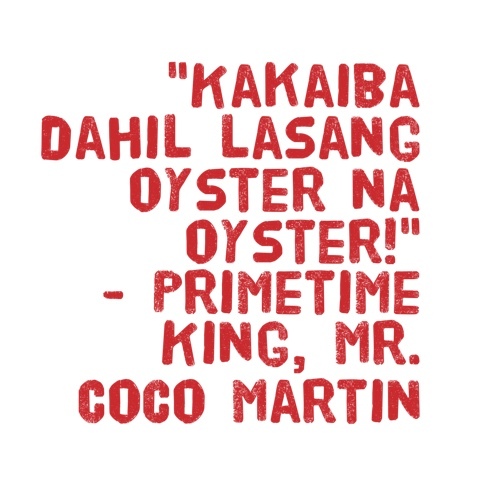 A fan of his grandmother's coooking and graduated with a degree in Hotel and Restaurant Management, Coco loved how Sarsaya Oyster Sauce can add that delicious and authentic flavor that truly enhances simple dishes. 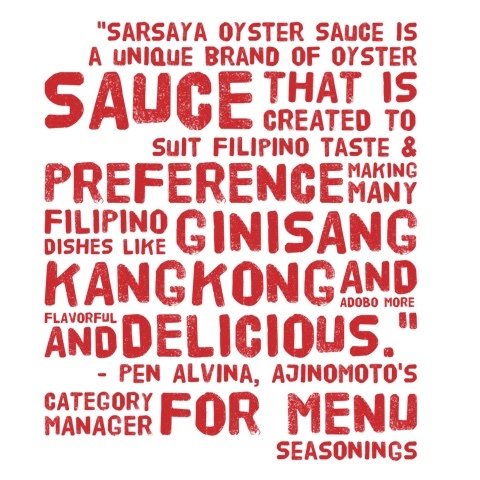 Let me share with you some recipe ideas you can cook using Ajinomoto Sarsaya Oyster Sauce from the Ajinomoto Team themselves! Add a different taste to your pancit! 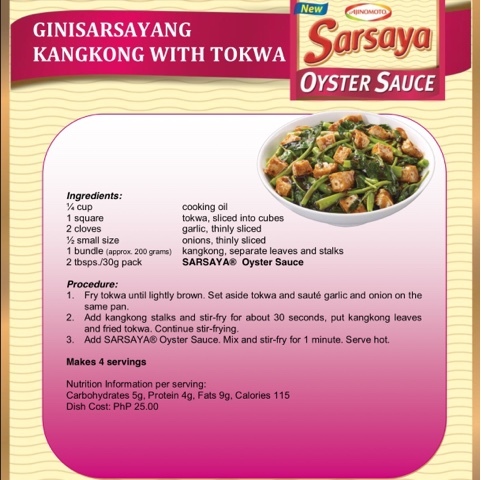 A chicken recipe that's quick to make with Sarsaya Oyster Sauce! 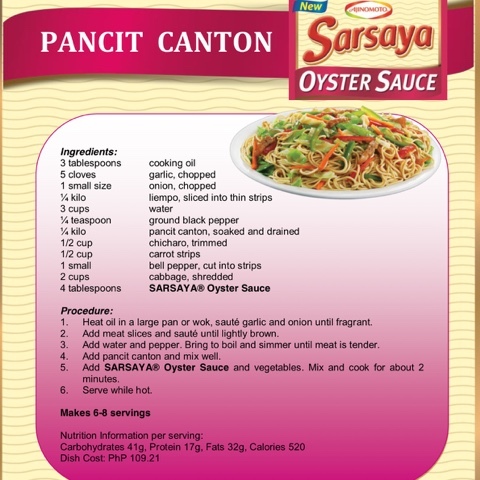 Of course, I wouldn't pass up the chance to whip up my own dish using Sarsaya Oyster Sauce for my family who loves to eat. Really, cooking was a breeze! I felt like a Master Chef. 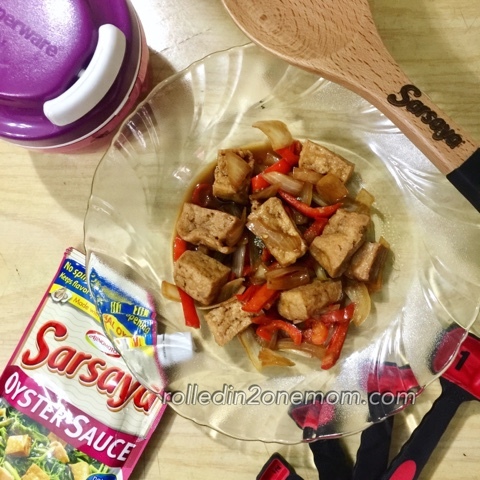 Sarsaya Oyster Sauce not only brings a different flavor and taste to your dish but it also gives this chef-wannabe Momma a little extra confidence when it comes to experimenting with recipes! 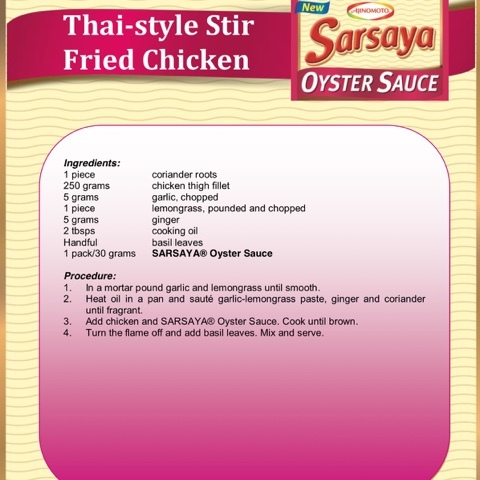 Sarsaya Oyster Sauce is available in 30g pack and 150g stand-up resealable pouch. Also try Ajinomoto's Sarsaya Sweet & Sour Sauce, available in 200g stand-up pouch, for a delicious blend of pineapple and tomato flavor. Get yours now and become an instant expert cooking momma! 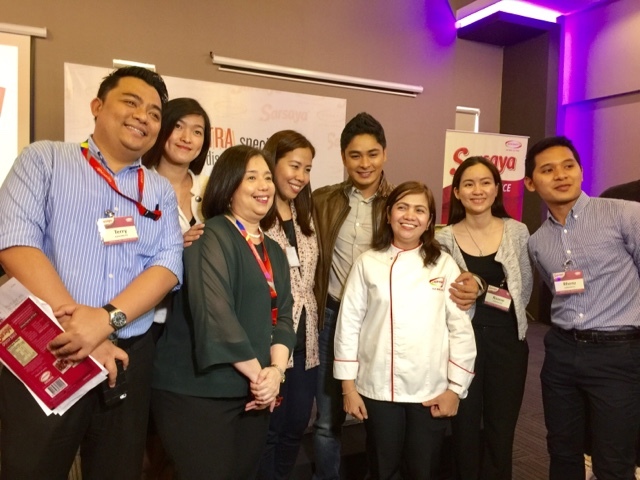 Mr. Coco Martin with Ajinomoto Family. Ajinomoto Philippines Corporation (APC) is an affiliate of Tokyo-based Ajinomoto Co., Inc. Established in 1958, APC lives by its promise to provide consumers products that will always give the delicious taste to healthy and nutritious meals as embodied in APC’s slogan Ajinomoto® “Eat Well, Live Well.®” APC’s complete line of quality food and seasoning products are produced by international affiliates and local toll manufacturers using Ajinomoto’s license, quality standards and technological expertise. APC’s products include AJI-NO- MOTO® Umami Seasoning, Ajinomoto® Brand Ginisa Flavor Seasoning Mix, AJI-SINIGANG® Cube, Ajinomoto® Brand Chicken Powder, PORKSAVOR® All-in-One Seasoning Mix, CRISPY FRY® Breading Mix, CRISPY FRY® SEASONED CRUMBS®, TASTY BOY® All Purpose Breading Mix, AJI-SHIO® Seasoning Mix, SARSAYA® Oyster and Sweet and Sour Sauce and “amino Fres-C” Instant Drink Mix.